Does "grayed out" mean you cannot open them? I can't reproduce. Thanks! It worked beautifully and I do not have the skills to make one of these by myself. Wow thx a ton :D! My curiosity was eating me from the inside out. I couldn't stop thinking about that removed message. is there a 32bit compatible version of the exe? Here is a version compiled using 32bit Python. Perhaps it will work. When I select the chatsync subdirectory the program gives me the following error: "Done. No non-empty conversations found or could be loaded.". What am I doing wrong? Apparently the program is either unable to find files it could parse successfully. It could be due to some changes Skype made to the file formats in the later versions or some specifics of your conversations the code does not take into account. Unfortunately, there is no way I could debug the problem without access to your chatsync folder. Hey, even I am facing the same issue. I am using Skype 4.3 for linux. The folder structure is something like chatsync/fe/fe***.dat. As mentioned, I cannot help with that as I can't reproduce those errors. The project is more of a toy example rather than something super reliable anyway. The source code is up for fixing in github, so your best bet is to hope that at some point someone skilled enough will be able to reproduce and debug the issue. The 32bit one worked really well, but theres a removed message that i want to read from the 16th september 2013 but only shows messages from 9th september 2013 for that person. any help? I don't think I could help here. Either Skype did not save that message on your computer, or the way the file is read somewhy prevents reading this message. it seems like messages from the past week are not there but the rest are. Does this mean i have to wait and hopefully it will be there some time next week? I am not sure, but I'd guess no, as I believe Skype client would not syncronize all messages, leaving the older ones out. Week-old sounds old enough for me to not synchronize them any more. Is there any way for one to view deleted messages from a group chat? I presume those might also be somewhere in one of the data files in the chatsync folder. If it is not the case, I'm not sure how to get those at the moment - I did not study the data formats to that level of detail. First off thank you for creating this as this works amazingly and has been of great use to me. I have a similar issue as the gentleman above who needs to recover deleted data from a group chat and I was wondering you could look into making the python package work with group chats. Either way thank you very much for creating this. At the moment I certainly do not have the time to look into it, nor does there seem to be any public information about the relevant data formats that would help me out. But perhaps eventually either I'll find the time or someone else decides to contribute this effort. The code is open for improvement, after all. Thanx a ton as its worked well!! But i have one query as when i read the main.db file the chat is marked as removed with person x while in chatsync folder the chat is completely missing with person x. As I mentioned above, I'm not that knowledgeable about all the details of the data formats of Skype chat syncing to answer such questions. It could be the case that the corresponding chat is not synced to that machine (you chatted on another machine). But this is not necessarily the only possible explanation. But it shows only conversations with not more that 2 participants. Is it possible to retrieve messages from conversations with more than 2 participants? I wanted to retrieve simple one to one conversations but I always get message : "Done. No non-empty conversations found or could be loaded". If I choose another 'chatsync' directory for a user that has not cleared his conversations, I get all the conversations. Am using the windows version of the app. I have even created a new Skype ID on my PC, made only 1 conversation and cleared it, then use your App to load the 'chatsync' directory for that user, same error as above. Thanks Konstantin for this app. You said earlier that this prob could be due to the latest version of Skype. However has someone been able to lately recover deleted messages ? P.S. am using Skype 7.22.0.109 on windows 7 64bits. As I said, I really wish I could be able to help, but I am not familiar enough with how Skype works and what might change in the newer versions. For example, it may be the case that chatsync files are not created in all situations, but only when the Skype "decides" to synchronise things from one machine to another for some reason. It may very well be due to changes in the recent Skype version. I'm running 6, where things seem to work. Given the overall history of Skype getting worse with newer versions 🙂 I'm somewhat reluctant to upgrade. If the format changed in the new version I wouldn't probably find the time at the moment to study it in detail again to fix things. Hello Konstantin, I have tried to read the files but it can't read them, I can send you a file in order you can debug and check it out if that is possible to read. There are six files that I would like to get the text. Thank you!! I have a question: I've downlaoded this file hoping to see what the my chat-partner deleted. After finding the chat, the deleted messages can not be find. The only thing you can find is the chat, which can also be read on Skype. Could you help me pls? I think that newer version of skype have either changed the format of their chatsync files or stopped syncing removed messages. So my question is this: if I am offline, the program won't record the messages that were sent to me? I suspect that newer Skype versions handle deleted messages differently, perhaps not storing them in chatsync files anymore. Given what I read in the last comments here, it seems that way. HI Konstantin, I have skype .dat files from 2007. When I try to open them i get msg "Done. No non-empty conversations found or could be loaded.". can a skype conversation be retrieved where in the setting of the skype you uncheck the saved conversation and when you did not manually saved or deleted any conversation? Note that it seems that recent versions of Skype have a file format which is different enough for this tool to be unable to recover messages. I need help to find a way to read a deleted message that someone deleted. I tried the application and all i can see are the chatsync ones that date back but not the recent ones which i want. Can someone help me please? I think you're out of luck at the moment. 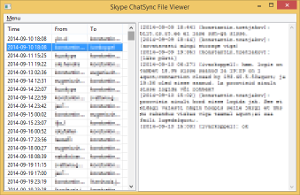 Since the latest updates Skype seems to have stopped using chatsync files (or changed the way it uses them), so the tool described in this post does not work any more. Is it true that the file can be edited / manipulated - so that IM chats being sent and received can be changed on the file - so the conversation can be shown to be different to what actually took place? If done - are there any traces / logs of changes on the file? The main.db file, as far as I know, is a SQLite database (you can open it with this tool, for example). Not sure about logs or changes either (however, common sense suggests that "securing own logs" is most probably not among the core functionalities a typical IM software would need to have). If you are really interested, a tool like Sandboxie might help you find out more precisely what files are written to and when.